Assumed Audience: people interested in audio post-production for podcasts. 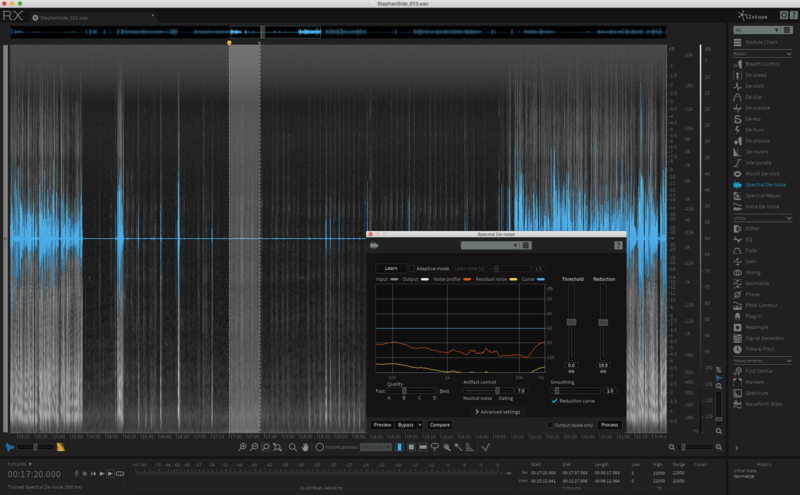 For the last I’ve been using iZotope RX1 to post-process the audio for the various podcasts I produce. It is an absolutely astounding piece of software, and if you’re at the point in your podcasting work where it makes sense—and if you have the budget for it!—I very, very highly recommend it. First, let’s me say something really important, though: for most podcasters, this is not where you should be spending your time or money. You will see far more improvement by investing first of all in your microphone technique, secondly in your microphone itself, and third in your recording environment. Feel free to skip this aside if you’re already in the know about these basics! Your recording environment: changing the sound dynamics of your space is often easier and certainly cheaper than investing post-processing software—and, just as importantly, it will dramatically reduce the need for post-processing software. All of those things being true, there are still times when post-processing software is useful! If you’re recording interviews3 in particular, you can have the best control over your own sound in the world and still need post-production software. You may have limitations on how much you can change your recording environment. (I was living in seminary housing when I picked up iZotope: I literally didn’t have room for sound treatments on the walls in my recording area!) You may have times when there are unexpected noise inputs. And for all of those, iZotope RX is just astoundingly good. Many people interested in basic audio post-production have likely experimented with the denoising functionality in Audacity, or even used a better tool like the one in Adobe Audition. I’ve used those, and they were okay for certain kinds of noise, but I ultimately found them wanting and never much used them. iZotope’s Spectral De-noise tool is not like those. It consistently removes all the noise matching the profiles you give it, and—more impressively, if you’ve used Audacity or even Audition—it does it without destroying the quality of the actual audio! Other tools require a bit more finesse to use than the spectral denoise, but are equally powerful: De-ess and De-plosive to cut down harsh “s” sounds and loud “p” or “b” sounds,4 Mouth De-click to deal with overly aggressive smacking and clicking noises; Breath Control to cut down the volume of those sharp intakes of breath that can sound odd in a discussion… there’s a lot here, and they all work extremely well if you deploy them judiciously and use them when you need them. 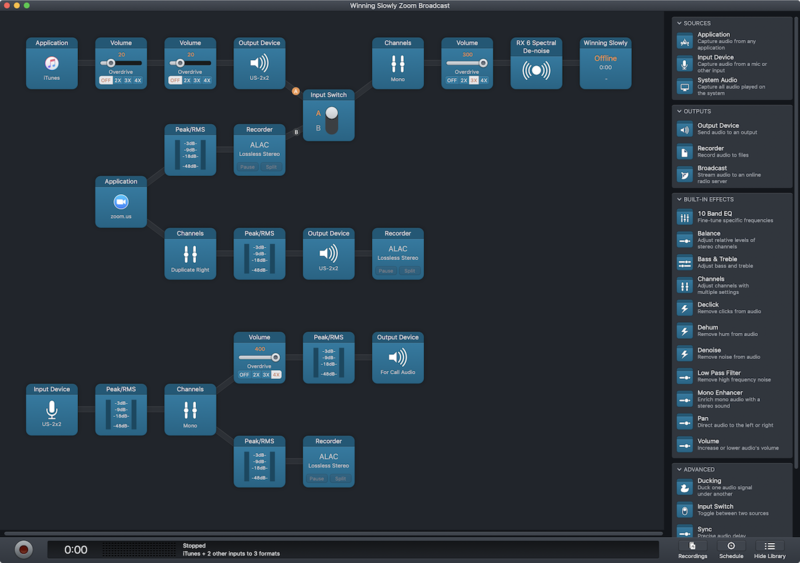 The thing that actually prompted me to write this up, though, was my discovery a little while ago that these are all standard Audio Unit plugins—which means that you can use them in other tools on macOS. And the secret sauce here for me was combining them with Rogue Amoeba’s Audio Hijack software and an Icecast server. I took my local audio, punched up the volume, and then ran the Spectral De-noise plugin against that audio just before streaming it. It turns out that even with my not-at-all-cheap recording setup5, I end up with some low-level (but quite audible! background hum when I punch up the volume like that. I use iZotope to kill that, so that the listening experience for any live listeners to the show when recording get something nearly as nice as the final product, at least in terms of sound quality. The net of all of this is: if you’re making any reasonable amount of money from your podcasting, and you’ve already invested in your technique, equipment, and environment… you should buy iZotope. It’s amazing.